No hits? No problem. Just sell "everything else"
Unlimited choices for customers mean complex challenges for businesses, but a new book explains how they can profit in an increasingly diverse and fragmented marketplace. The other day I was checking out a music blog devoted to an obscure British band that broke up about 30 years ago. The site was in Portuguese, but it was no big deal to have Google translate it into a comical yet comprehensible form of English. I like to think that I have rare tastes, but according to this new book by Wired magazine editor Chris Anderson, as mass culture becomes stratified and splintered, such pockets of unique and individual favorites are not only growing more common, but also represent a new economic phenomenon, which he calls "The Long Tail." Though we continue to obsessively measure mass-market offerings with bestseller charts, opening weekend grosses and other dubious metrics, as the mainstream shatters into a billion pieces, the hits compete with an infinite number of niche products. This shift has been coming for years as mass media — newspapers, television and radio -- have become increasingly ineffective in reaching most of the people, most of the time. More often than not, our tastes, and therefore our choices, are determined by our age, gender, education, location, ethnicity and other more random factors. They are not, by any means, absolutes. 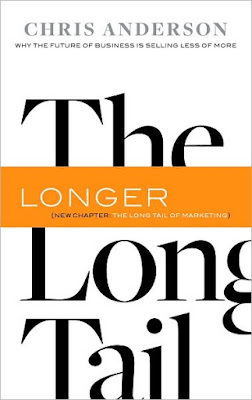 In fact, this lack of predictability along with growing individualization are what makes The Long Tail so powerful. While it may be true, for example, that this great newspaper is the single best medium for reaching the most people in this media market, you will still not be able to reach most of the people in this area just by advertising here or in any other single newspaper, radio station or TV channel — even one carrying American Idol! The predictability of successfully reaching the mass market is dead. Anderson says that the majority of things fall into a third category: ''everything else.'' TV shows and movies that may not have been successful upon initial release will inexplicably explode in sales as DVDs, for example. The animated Family Guy series was canceled and then renewed after so-so broadcast ratings but huge home video sales. The U.S. version of the British TV show "The Office" teetered on the brink of extinction due to mediocre ratings on NBC, but its popularity as a download on Apple's iTunes store ensured its survival. Anderson's book is both insightful and entertaining, especially if you enjoy watching the sparks created when commerce and culture bump into each other. But it's not just high-concept meditation or bombastic bloviation; he provides plenty of left-brained data, including sales charts, graphs and more to demonstrate the phenomenon and show how astute marketers might deal with this shift in the importance of the mass market. This new hierarchy — or non-hierarchy — can and will confound and mislead plenty of executives, especially those who lack depth in their inventory or their imaginations. A business that can take advantage of this diversity, either by offering a wide array or choices — or specializing in a very specific niche — could prosper. Either way, the customer is in charge.